The Panhandle Trail is another jewel in the Pittsburgh metro area trail system. A Conrail line, known as the Panhandle Railroad, once connected Pittsburgh to Cincinnati, Chicago and St. Louis on this route. The rail corridor has been transformed into a multi-use, non-motorized trail stretching nearly 29 miles, from Weirton, West Virginia, to Carnegie, Pennsylvania. Today, the wide trail is open to pedestrians and cyclists, with many easy access points along the way. Starting in West Virginia, the start of the trail is actually some 3,000 feet to the east; it’s a dead-end and trail users won’t miss much if they simply begin at the trailhead off Colliers Road. The trail follows the route of Harmon Creek, which itself feeds into the Ohio River, for the entirety of its West Virginia route, and several miles through Pennsylvania (in Midway, Pennsylvania, it picks up alongside Robinson Run and stays with the creek for the remainder of the trail). At the confluence of Harmon Creek and Paris Run, the trail crosses the West Virginia–Pennsylvania state line, marked with a white rail sign. With such a close relationship with rivers and creeks, the trail features many small bridge crossings as it cuts through the rolling and, by turns, rocky hillside, showcasing many opportunities for photos, especially in the fall. Spring and summer, when flowering shrubs and wildflowers dress up various landscaped trailheads and access points, are great times to bike the Panhandle. Between June and October, the Collier Friends of the Panhandle Trail sponsors several annual events on the trail. 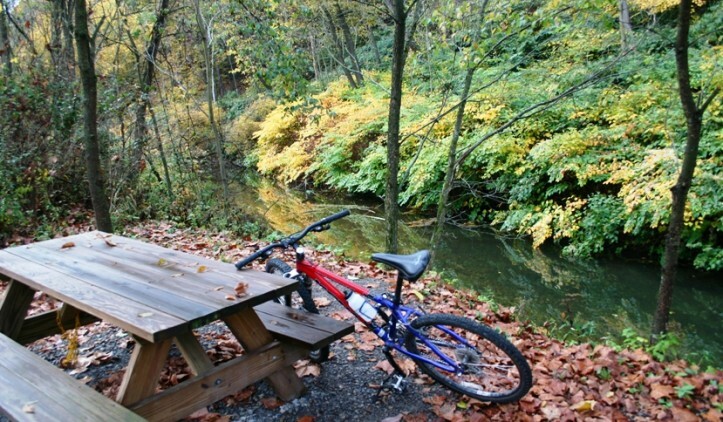 The trail passes through several small towns, like Burgettstown, Pennsylvania, where you can grab a bite to eat or drink at near-trailside stores or restaurants. This is a region familiar with trail users, particularly when you approach McDonald. Just north of the Noblestown Road crossing, the Panhandle Trail forks to the north to cross the Montour Trail between the village of Primrose and town of McDonald, and ultimately links to Washington, D.C., via the Great Allegheny Passage and C&O Canal Towpath. Continue east to finish out the Panhandle Trail where is merges into Walkers Mill Road outside of Carnegie. Recognized as a valuable resource and landmark for residents, the Panhandle Trail was the 100th successful rail-trail project in Pennsylvania. As such, it generally enjoys speedy and routine maintenance from the many governmental organizations that oversee the trail, though the friends group maintains the 2.6-mile section from Walkers Mill to Greg Station. To reach the Weirton, West Virginia, trailhead, exit US 22 at Harmon Creek Road, heading south. Turn right on Colliers Road, and then another right to stay on Colliers. Trailhead parking in on the right in a lot under US 22. To reach the Carnegie, Pennsylvania, trailhead, take Interstate 79 south to Noblestown Road. Turn and head west 1.7 miles to Walkers Mill. Turn left on Walkers Mill Road and then go 0.1 mile to a parking lot on the right where the trailhead is marked. To reach the Montour and Panhandle trails trailhead near McDonald, Pennsylvania, follow US 22 west from Pittsburgh to State Route 980 just west of Imperial. Take SR 980 south to McDonald and turn right on Noblestown Road. The trailhead parking and access is at the intersection of Johns Avenue and Noblestown Road.